As far as console gaming nostalgia goes, the Atari Video Computer System (VCS) is ground zero. While Spacewar! and Pong prototyped interactive game experiences within the academy and for the local bar, it was the Atari VCS that became a fixture in living rooms across America. Launched in 1977, the system overcame an initial chilly reception to enjoy massive popularity in the early 1980s. Approximately 30 million Atari VCS consoles were sold and the system, along with arcade titles such as Space Invaders and Pac-Man!, drove the first mass culture video game mania that lasted until the bottom fell out of the market in 1983. The Atari VCS was affordable, accessible and provided a "domesticated" counterpoint to the haze of arcades - an experience that families could gather around and socialize through. Given the initial cost associated with personal computers, it was the Atari VCS and titles like Combat, Adventure and Pitfall! that indoctrinated an entire generation of gamers and set the wheels of a multibillion dollar industry in motion. Considering the evolution of video game consoles (seven generations and counting), the cultural significance of the Atari VCS alone would justify another book-length appraisal. However, Nick Montfort and Ian Bogost's collaborative text Racing the Beam, published this past spring by MIT Press, was developed with a broader mandate in mind. The book is the first in a new series dedicated to a "platform-focused" approach to media scholarship. A cultural reading of the Atari VCS would address aesthetics or "reception" to the console and Bogost and Montfort argue that it is possible to drill down from that strata of analysis to interface, then form/function (narratology) through to code. The scholars acknowledge that while code has become a nexus within media scholarship in recent years, it is possible to dig deeper still to platform - "the basic hardware and software systems upon which programming takes place... the foundation for computational expression." The subsequent analysis of the Atari VCS is firmly grounded in the technical capabilities of the system. Under this scrutiny the figure of the console melts away. Racing the Beam surveys six seminal cartridges in relation to key components which include the MOS Technology 6502 microprocessor, the Peripheral Interface Adaptor chip (PIA), memory and the pivotal Television Interface Adaptor (TIA) - the operation of which inspired the moniker of the book. This sounds dry (and at times it is) but the duo do a remarkable job of providing a close, nuanced reading of the design decisions, play and game space of the titles in relation to the assemblage of electronics that underpins the system. Surprisingly, Racing the Beam does not read like an electrical engineering textbook. For the most part, Montfort and Bogost's analysis of the design of the selected Atari VCS cartridges is extremely engaging. The discussion about sprite graphics and game variants in Combat! is fascinating and the analysis of virtual space in Adventure makes most writing on "the architecture" of gaming seem tremendously unimaginative. Pitfall! serves as a springboard into discussion about not only the platformer genre it helped establish but broader issues of authorship and labor. The chapter on the rushed, undercooked conversion of the iconic arcade game Pac-Man to a pale (flickering) Atari VCS imitation reads like Shakespearean tragedy. The authors use these games, as well as Yar's Revenge and Star Wars: The Empire Strikes Back to conduct a thorough examination of the development process, interface elements, level design, and graphic idiosyncrasies afforded by the Atari VCS - all the while framing the last thirty years of game history. 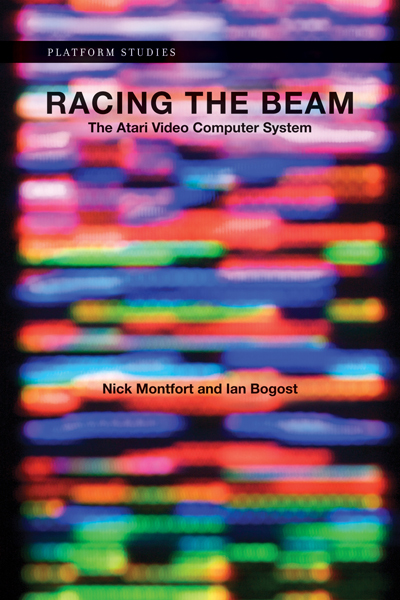 It is hard to levy any substantial critique at Racing the Beam as the book abides by its promise to parse the Atari VCS as platform by way of the code and context of specific cartridges. Readers that are less technically savvy might feel a bit alienated by the time they hit the third or forth analysis of TIA graphics registers but Bogost and Montfort should be commended for making this material not only accessible but entertaining. While the "platform approach" is clearly not for everyone within game studies and the digital humanities, this text needs to be read and considered as it provides a robust example of media scholarship. Towards the end of Racing the Beam the authors tip their caps at the artists and hackers that are developing content for the Atari VCS within the burgeoning homebrew scene. This past spring a perplexed interviewer asked Montfort why anyone would still be working with the platform "given all the modern systems available." His reply: "Why does somebody write a sonnet? I think it's in part because they want to connect to the whole tradition of the sonnet that is different than writing a poem of a different form. They're interested in the sonnet because they're interested in what it is as a form." Montfort hits the nail on the head and he and Bogost have exhibited the same dedication to both tradition and form. HaHaa! I still remember being taught how to play DEFENDER by my mom on this platform . Defender is one the the true ancestors of current horizontal shoot'em ups like Gradius. 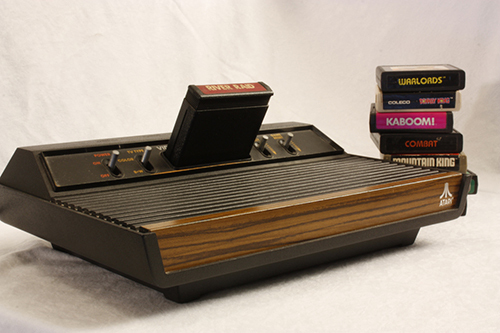 I've spoken to a lot of people including video game superplayers (all they do is brake records and finish games) who completely gave up all the latest video game platforms to favor the old ones like this atari. They just knew better 20 years ago as far as creating enjoyable video games. Not having the same technical abilities forced game developpers to be masters at gameplay fun. I love the video of Pitfall. My dad still has a working Atari 2600 and we hooked it up to an old television set and played that game along with a bunch of other ones. The graphics are really outdated but it was still fun to play the game. If you watch the video it's weird to see a game with such little sound and no background music but I guess that means you could just concentrate on playing the game! Pitfall! is a strange game and I have a new appreciation for it after reading 'Racing the Beam'. Although my memory is hazy, what I do clearly remember is hating those scorpions - there was no wiggle room in clearing them with a running jump.